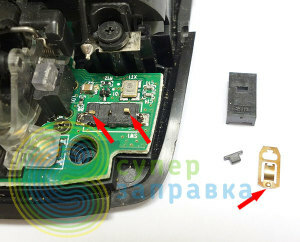 This article shows how to repair the Logitech Anywhere Mouse MX Black USB by yourself. A few years ago, the question about a new wireless mouse came up. I needed it for my everyday work with computer, not for games. After scrolling the web for a while, I have chosen the Logitech Anywhere Mouse MX Black USB. Well, the mouse happened to be quite worthy: stylish body, fits the hand perfectly, works smooth on any surface. The weight of the mouse is comfortable – it’s pleasantly heavy. It’s powered by two AA batteries. 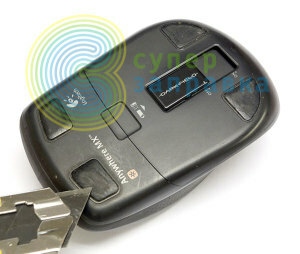 With Duracell batteries, you can use the mouse for 12-14 hours a day and it will stand you about a month. It uses the unified transceiver that you insert into your computer, and that transceiver is able to connect up to 5 devices in addition to your mouse. 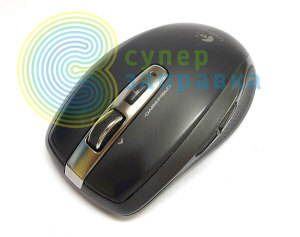 You manage these devices via software that you can find at Logitech web-site. I’ve bought the same mouse to my workplace. After a few years of heavy use, mouse malfunction appeared. I press the left mouse button once and instead of one click it makes double click. It was hard to work since. 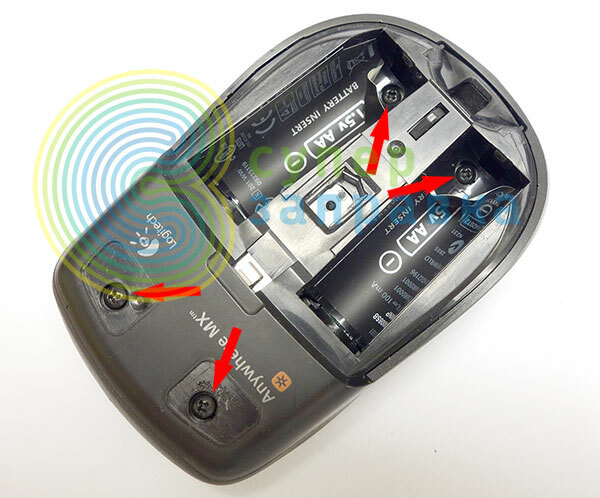 I’ve scrolled through some forums, and founded that Logitech treats customers loyally and will exchange your broken “rodent” and other devices for the new ones. So, we can try to hit the jackpot and change it. But we would rather go different way and try to repair it by ourselves. Those who are good at soldering may not read the article, since you need to take the mouse apart, unsolder the button, take it apart and face up a contact. Nothing too complicated. The first mouse was repaired in the same way. When the time has come for the second mouse, I’ve decided to try to repair it without a soldering iron, which I’ve managed to do. And that is what I’m going to tell you; maybe you’ll find it useful. So, first you need to take it apart. Take the knife, screwdriver or something suitable to take sliding pads off. You want to take them off so the adhered layer will stay on the pads, not on the mouse. This way it will be easier for you to put them back. Take them off. You will find two screws under them. Unscrew them. Now, take the battery lid off and take out the batteries. There are two stickers near the positive connectors. Carefully turn up the stickers and unscrew both screws under them. Take off the upper piece of the mouse. Next, we need to make a tool to open the microswitch up. At first I’ve tried a sewing needle, but nothing came out of that. The body appeared to be pretty fragile and when I was pushing the needle through it started to crack. I was quite upset, I thought nothing will do but soldering the microswitch. 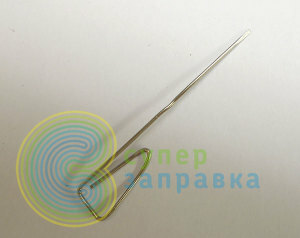 But then I saw a clip, usual paper clip. We need to work it with the file so it looks like a small wedge. Like a flat-tipped screwdriver. The thinner the wedge, the better it will penetrate between mouse button cover and the base of it. Push the clip wedge under the microswitch cover carefully and give it a slight spin. The cover should come off a bit and unsnap. Do the same thing with the right side. So, we’ve the microswitch taken apart. The main part is done. Get all the components together so you won’t lose anything. Using a fine sandpaper or just a knife, clean up the terminals that are shown by the red arrows. Then, set the moving contact as shown on the picture. You better use a tweezers here, because these parts are really tiny and you need to be as attentive as possible. You lose the contact once, and that’s it. One more thing. The microswitch cover is super tiny. While I was setting the mouse up, it flew somewhere, and I thought that was it, I have no mouse now. But after 10 minutes of search I’ve found it. So be very attentive and set the button carefully. 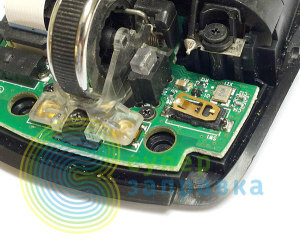 Also, to make the setting up easier, you may put some lubrication on the inner side of the microswith, so when you will be clipping the button back it won’t fall out. That’s it, now you take the microswitch lid and the button, place it on the base and clip it on. Now fit the mouse up in reverse order. I’ve repaired both devices this way, and both of them are still working. I hope this article was useful for you and you will prolong the life of your “rodent”. Great article. I’ve followed a different route. 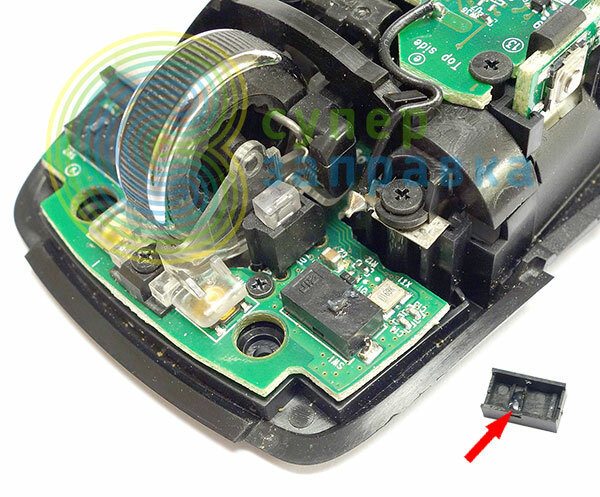 The microswitch is made of a stronger plastic than the cover of the mouse, which you normally push to contact the switch button inside. Since the cover is super flexible, you can push it up and uncover the spot that actually touches the little button on the switch when you click. If you inspect this spot carefully, you’ll discover that it it just a tiiiiny bit worn out. That is what causes the double clicks. You can place in that spot the smallest piece of tape, cut in a rectangular shape like the shape of the worn out plastic spot under the uplifted cover. We are talking for a piece of tape with dimensions 1mmx3mm. So tiny. I’ve done that and i have a fully working mouse, without even losing the warranty for opening up the mouse and unscrew the screws. Hope i make sense and sorry for my english. 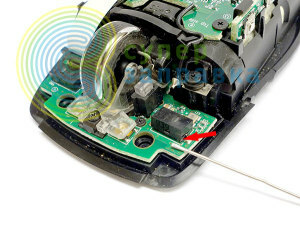 Thank you so much, I searched the web and found this tutorial that helped me repair my mouse. I struggled a bit but with patience and following the steps I did it!